Expecting the land’s carbon absorption to make up for emissions from burning fossil fuels masks the need for real climate action, say scientists in Australia. Land carbon is the biggest source of emission reductions in Australia’s climate policy centrepiece – the Emissions Reduction Fund (ERF). This is smoke and mirrors: a distraction from the real challenge of cutting fossil fuel emissions. Figure 2. 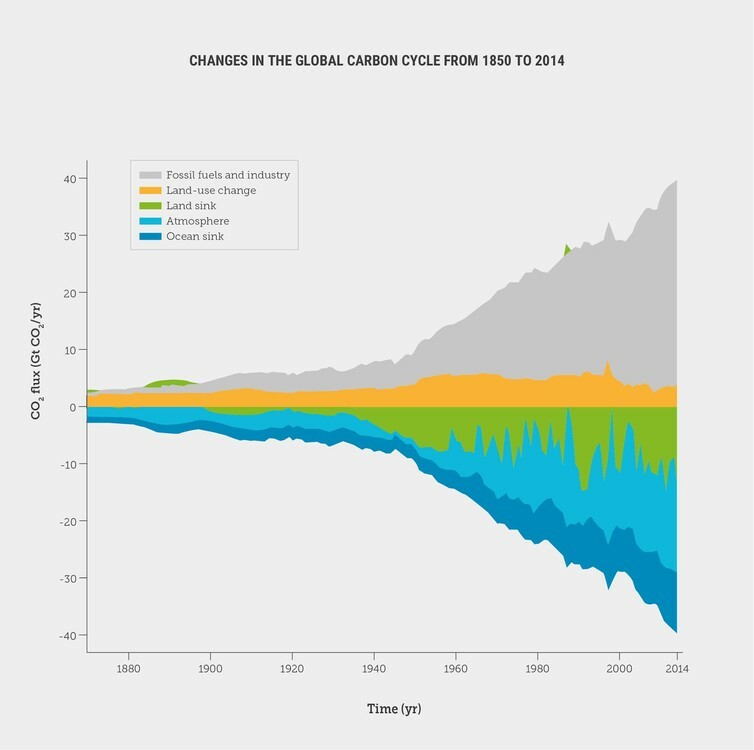 Changes in the global carbon cycle from 1850 to 2014. Positive changes (above the horizontal zero line) show carbon added to the atmosphere and negative changes (below the line) show how this carbon is then distributed among the ocean, land and atmosphere. Adapted from Le Quere et al. 2015, data from CDIAC/NOAA-ESRL/GCP/Joos et al. 2013/Khatiwala et al. 2013. Last December, Australia joined the rest of the world in pledging to do everything possible to limit global warming to no more than 2°C above pre-industrial levels, and furthermore to pursue efforts to limit the increase to 1.5°C. Yet Australia lacks a robust, credible long-term plan to cut Australia’s CO₂ emissions from fossil fuel combustion. Current climate change policies and practices in Australia allow for the use of land carbon “offsets” – that is, carbon taken up by land systems can be used to offset or subtract from fossil fuel emissions. For example, the government’s ERF provides financial incentives for organisations or individuals to adopt new practices or technologies that reduce or sequester greenhouse gas emissions. Australia’s fossil fuels are pumping 6.5 times as much carbon into the atmosphere as the land can absorb…while storing carbon on land is useful for combating climate change, it is no replacement for reducing fossil fuel emissions. Martin Rice is Head of Research of The Climate Council of Australia and Honorary Associate, Department of Environmental Sciences at Macquarie University. Will Steffen is Adjunct Professor at Fenner School of Environment and Society, Australian National University. This article was originally published on The Conversation.